Let’s focus on predictability for a moment. We might delight in the spontaneous laughter of a child while at the same time appreciate the reliability with which our newspaper arrives each day. 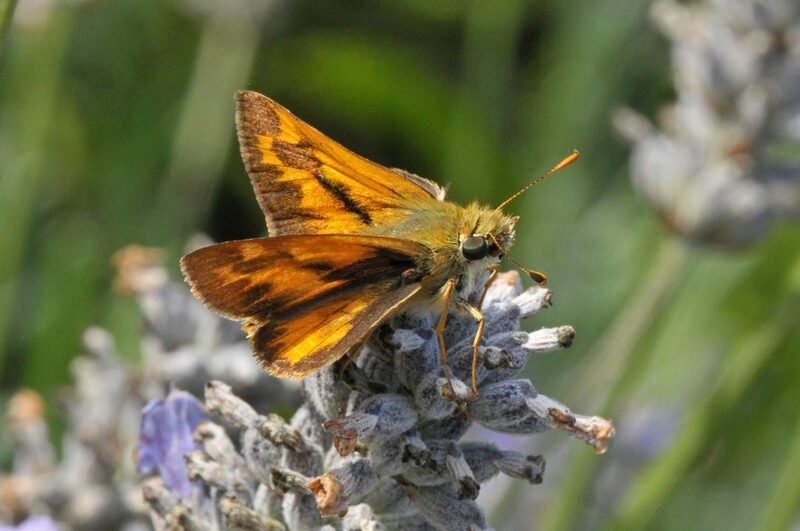 We’re a mixed bag, but so too is the Woodland Skipper. A smallish butterfly with a wingspan of just about an inch, this common species can be difficult to find until early August rolls around. And then, just as predictably as the yellow light turning red, they are everywhere. But they also demonstrate unpredictable qualities. Their compact, hairy bodies resemble that of a moth while their “knobbed” antennae are like those of a butterfly. This dichotomy continues while they are at rest, for they hold their hind wings flat in the same way as moths, yet the fore-wings are held partially erect over the body after the fashion of butterflies. The visual effect at first glance is reminiscent of a Lockheed F-117 Stealth Fighter or an F-35. But there’s really good news. Skippers have no problem flying, and you and I have been promised that through Jesus Christ, He gives us the victory. Praise God!